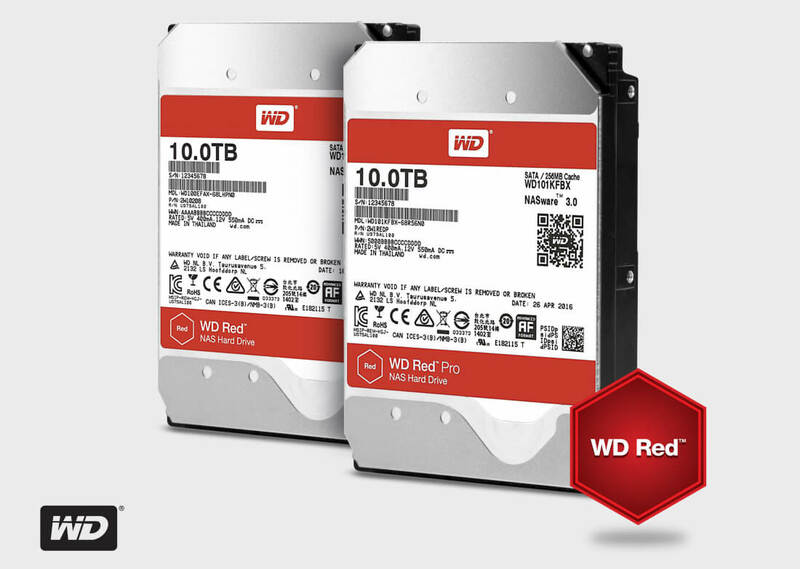 Western Digital now has large-scale network attached storage (NAS) solutions in the form of 10 TB HelioSeal drives added to their Red line. According to WD's subsidiary HGST, the Red and the Red Pro use platters hermetically sealed in casings filled with helium as opposed to air. The HelioSeal technology allows the plates to be thinner and spin faster and with less friction and turbulence. "Less internal turbulence also makes it possible to add more disks and heads to achieve even higher capacity per HDD," said HGST. More platters mean more storage in the same 3.5-inch form factor. The drives run cooler as well. Both versions have the same capacity and sport a 256 MB cache. They both support WD's 3D Active Balance Plus and NASware 3.0 to improve performance and reliability. Current users of Western Digital’s My Cloud Pro Series NAS systems can plug and go, since the drives are fully compatible. "Less internal turbulence also makes it possible to add more disks." The differences between the Red and the Red Pro come down to speed, NAS system capacity, warranty, and price. The Red is a 5,400 rpm drive compatible with NAS environments with up to eight drive bays. It is $494 and comes with a three-year warranty. It is more tailored for home or small business NAS setups. The Red Pro spins at 7,200 rpm and is designed for NAS systems that have up to 16 drive bays. It costs $533 and has a five-year warranty. The Pro is designed for the larger NAS environments and has improved shock protection. The drives will be released to retailers at the end of the month. Western Digital is also accepting pre-orders on its website. Pre-orders are “anticipated” to ship on May 31.